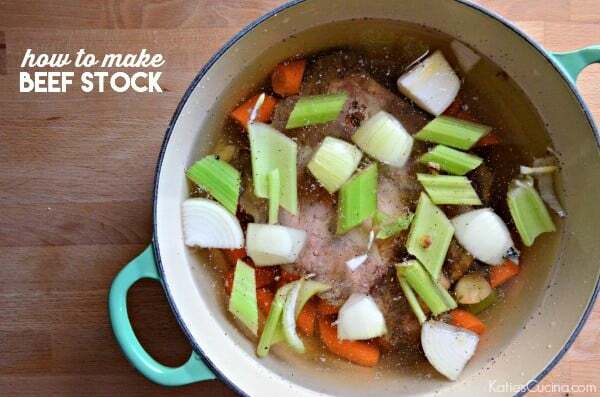 Today, I’m sharing my third “how to make stock” recipe. Last year I shared how to make both chicken and turkey stock. This year I’m sharing how to make your own beef stock. I made my first rib roast for Christmas. I was going to discard the ribs when my mom scolded me and told me I better save that and make a stock out of it. Silly me. What was I thinking. And thank goodness for wise moms! It never dawned on me to make my own beef stock. I guess because I never make anything with bones when cooking beef. For now on when I make steaks that have a bone instead of throwing them out I’ll just save them and make this beef stock. I recently shared a blog post from The Kitchn on my Facebook page. They break down the difference between stock and broth. Technically this would be considered broth because it has seasonings. But I like what they decided on…. a seasoned stock. I still think that if it’s homemade it’s considered stock and if it comes from a box its broth! Either way—it all tastes amazing. 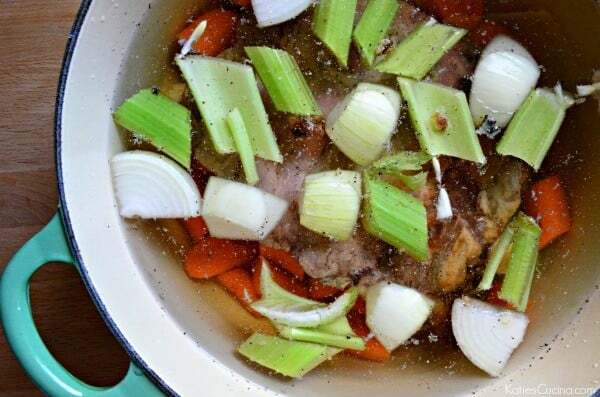 This seasoned beef stock consist of a rib roast bone, cloves of garlic, celery, carrots, onion, salt and pepper. Nothing more… and after simmering on the stove top for over an hour and then resting to cool for 2 more hours this stock is full of flavor! The day that I made this I was having a bad day…. bad day like I skipped dinner and had a glass of wine in a hot bubble bath kind of day. But before jumping in the tub and sipping on a little vino my husband helped me package up the stock. I told him to save the vegetables because that was going to be my dinner. After I finally got my miserable teething baby to sleep, I walked into the kitchen ate the tender carrots, onions, and a few pieces of celery. I discarded the leftover celery I didn’t want, poured myself a glass of wine and in the bath I went. Of course if you aren’t having a bad day and don’t want to eat the veggies for dinner you can use them immediately in a vegetable beef soup, save them for another meal or discard them. It’s totally up to you. I stored the stock in 4 cup increments in freezer bags. Remember to label them well with the name and date made. I then stored the bags in the refrigerator and the next day I skimmed off all the fat. Then I froze them. You can skip this step and freeze and then skim the fat off when you go to defrost. Either way works. 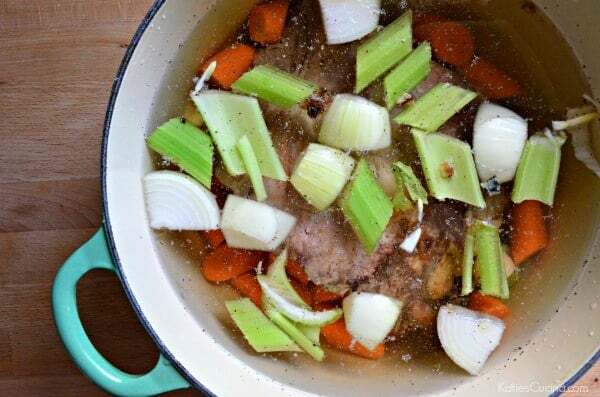 The next time you have a bone from a piece of beef DO NOT throw it away… instead making this homemade beef stock! Use a leftover rib roast bone and some fresh vegetables to make a rich and decadent flavorful beef stock. In a large 5-quart stock pot add the rib roast bone, carrots, celery, onion, garlic cloves, salt, and pepper. Pour the water over the beef and vegetables. Bring the stock up to a boil for 10 minutes. Then reduce to medium-low heat for 2 hours. Remove off the heat, let the stock cool completely. Strain out the bones and vegetables. Divide the stock in half and store in freezer safe containers. Use right away or freeze for up to 3 months. Make sure you skim the fat off once the stock has completely cooled.